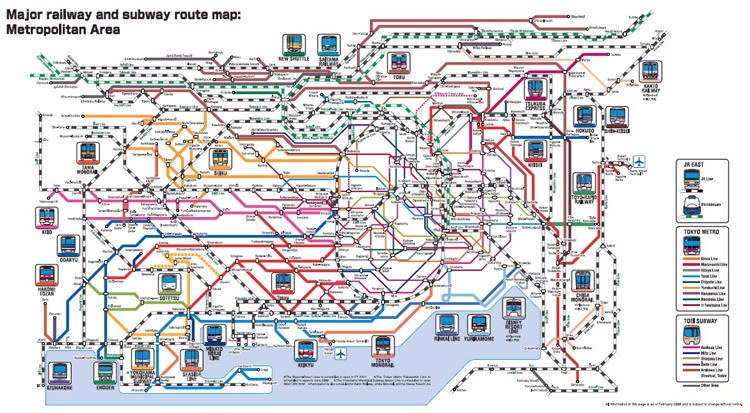 With a total of 121 rail lines and 882 stations, Tokyo's transit system is impressive. 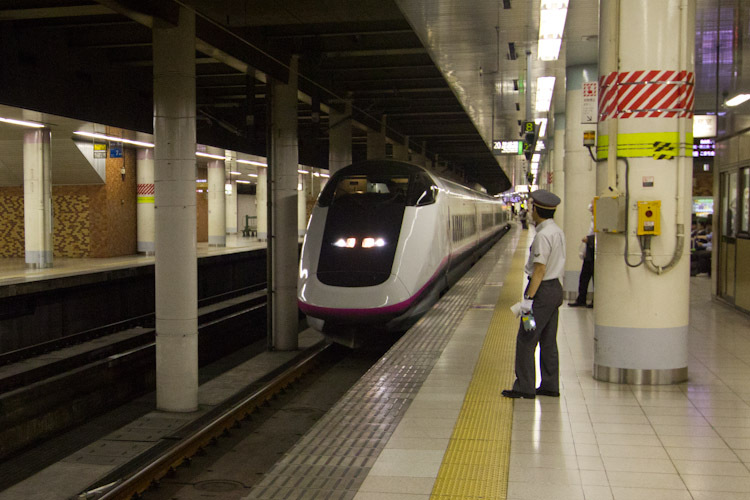 Over 40 million passengers use rail in Tokyo every day, and it's not hard to see why. Not only can you get anywhere in Tokyo using transit, the combination of medium distance above ground railways and short hop subway lines means you can get almost everywhere directly, often with several different options. The ease of travel makes tourism easy in Tokyo, especially with the abundance of English signage and audio prompts at stations. Still, the sheer complexity of the system can be overwhelming for anyone, and hopping around the city day after day could become expenseive. We were happy that we had opted to purchase a JR rail pass before leaving Canada. It allowed us to use the very useful Yamanote line, which circles Tokyo and stops in many of the big tourist destinations (Shibuya, Shinjuku, Tokyo, Ikebukuro, Harajuku). We still used the subway a few times, but usually opted for JR when it was available, even if it was less direct for our destination. Tokyo is the first city I have visited that rivals Toronto in its number and variety of restaurants. It's rare to find yourself out of smell-range of something delicious here, and gastro-tourism has probably been the highlight of our time here. Like Toronto, the complete gamut of restaurants is available here, from cheap street vendors to blow-your-budget-in-one-night dining. Half the fun for us was just the hunt for a good restaurant. We had a lot of fun wandering down the many small alleys in Ueno and Shinjuku, sizing up the many izakaya's and restaurants. Looking for ones with picture or English menus, and taking note of which ones were jammed with locals. 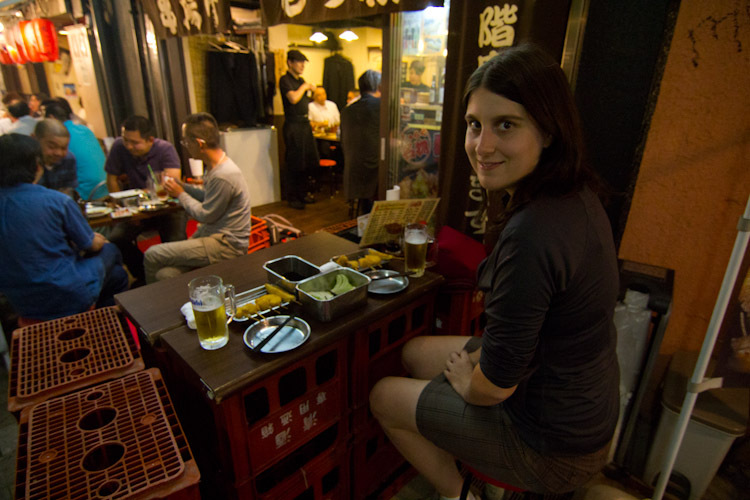 We had good luck one night in Ueno, and landed in a great little spot with 30+ options for tempura and cheap beer. After a while, a couple of older businessmen who could speak some English joined us and ended up buying us a few beers while we solved the world's issues. On those days when we were just hungry and tired and felt less adventurous, we were happy to discover that even chain restaurants with reasonable prices had great food. You can throw a stone from most major intersections and hit a Yoshinoya, which has cheap and reliable food. We also had some delicious ramen on two occasions from different Ichiran Ramen restaurants. Ichiran has become so popular that they've even opened a location in New York. Despite the fact that many of the streets, malls and train stations can be quite crowded, the politeness of Japanese culture prevents the rush from being overwhelming. You won't have anyone pushing you around on the subway, and if you learn only one word in Japanese it should probably be "sumimasen", which simply means "excuse me" or "sorry". On a crowded train, you need only whisper this word and you won't have a problem getting off at your stop. Even with a huge bag and fifty people in the way, people make way for you to pass, and always wait until everyone has left the train before boarding. At least for the younger generation, anything different is to be embraced. Cosplay (dressing up in costumes of characters from manga and video games) has taken off in the city, and whether you're in Shibuya, Shinjuku, Harajuku or Akihabara, it's not hard to find youth who are living more in the worlds they read about in manga or play in video games than in traditional Tokyo. Some of the other fringe cultures we're already familiar with are easily spotted here too, like the punks and goths. The contrast between the suits who power Tokyo's business towers and the youth who wander the streets of Harajuku ("where the catwalk got its claws") is striking. I'm not sure the older generation really understands what it all means, but to the kids I think it is everything. 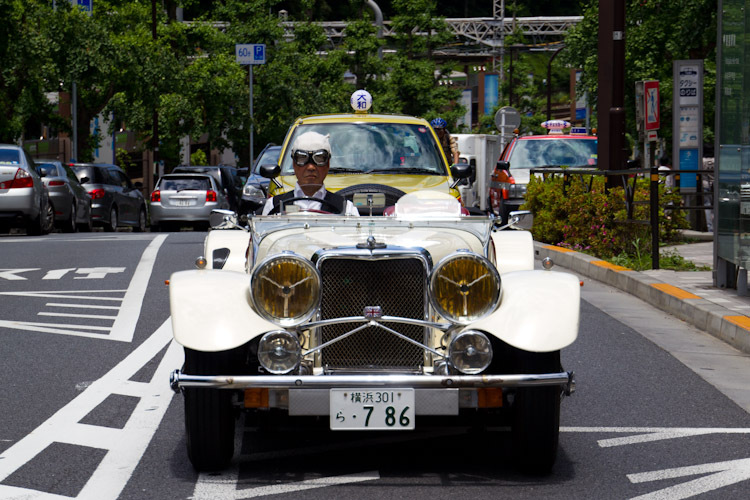 It provides them with a way to present themselves as unique individuals in a city where uniformity and career pressure have destroyed the lives of many salarymen. I suppose I probably dress quite "functionally" by Harajuku standards, but I have to say that I side with the kids on this battle of cultures; I'd rather be weird than boring. There is something thrilling about being caught up in a mob of people in business suits swarming out of a train into Tokyo station. Making a move for the escalator can often be like an olympic speed walking race, and you can easily find yourself caught up in the rush. The rush is particularly obvious at lunch time, when businessmen slurp back bowls of ramen with impressive efficiency. Many restaurants cater to business people exclusively, and do not offer seating, in favour of a counter to stand next to. Of course, we were never in much of a hurry so we opted for the slightly slower paced lunch spots which offer seating, but even still we would often see 3 or 4 people come and go from the seats next to us while we ate lunch. When the rush is enough, Tokyo has many beautiful parks to seek refuge in. The grounds are invariably kept very clean, and are often lined with impressive gardens and water features. The parks almost always have shrines or temples in them, and locals will often be spotted stopping by for a quick prayer at lunch. 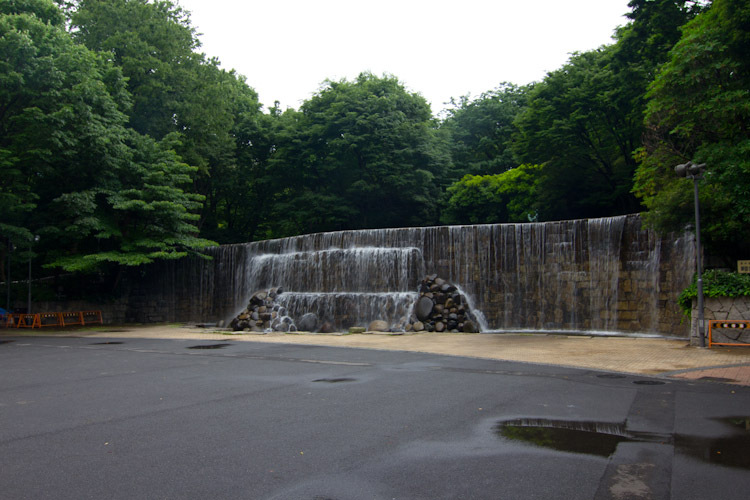 On nice days, they are also popular spots for picnics, but most parks (especially the one which surrounds the imperial palace) are large enough that you can still find your own quiet place easily. 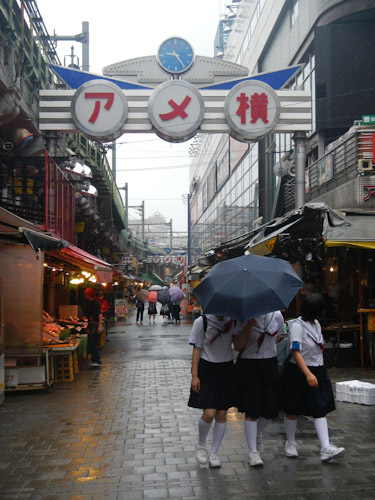 We often found ourselves retreating to Ueno or Shinjuku park with a couple of snacks and cold drinks. When you've had enough of Tokyo, and the parks just don't provide the relief you're looking for, the shinkansen is never more than a few subway/train stops away. You can take the bullet train north of the city to Nikko, or west to Hakone for only an hour or so and find yourself in protected nature areas suitable for a peaceful hike. 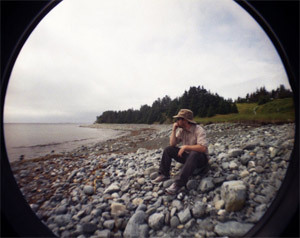 Contrast this to Toronto, where you're looking at a 3 hour drive to Algonquin park to escape the city for a day or two. "That's great... but was there anything you didn't like?" Pachinko and slot machine parlours are on nearly every block. They are thick with cigarette smoke and packed with desperate gamblers 24/7. It only takes a quick walk through these to see that it has affected many people's lives in a very negative way. Girl bars are reasonably easily spotted. While strip clubs are hardly unique to Tokyo, I find the trend of "maid cafes" slightly disturbing. Dressed in French maid style outfits, young women will serve you drinks in a submissive and semi-sexual way, calling customers "master" and so forth. Indoor smoking is still very common, even in restaurants. Nothing ruins a nice meal like a waft of menthol cigarette smoke up the nostrils. 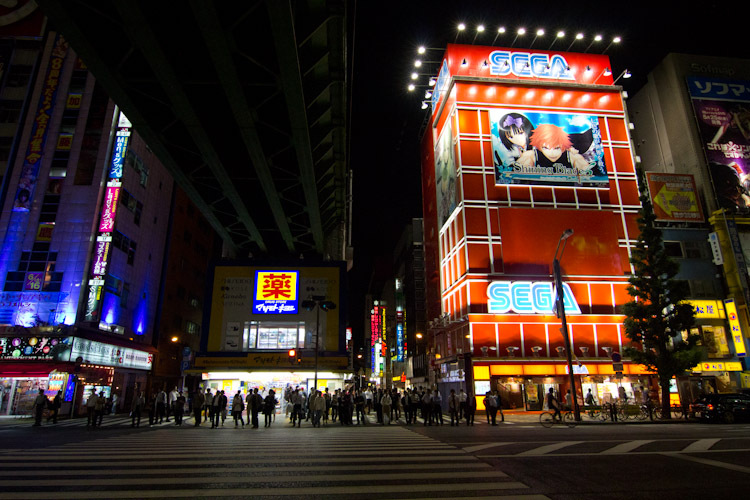 Check out Nicole's blog post about the specific things we did each day in Tokyo.